“You would put off the evil day, yet you hasten the reign of violence! Lying upon beds of ivory, stretched comfortably on their couches, they eat lambs from the flock, and calves from the stall! Improvising to the music of the harp, like David, they devise their own accompaniment. They drink wine from bowls and anoint themselves with the best oils; yet they are not made ill by the collapse of Joseph!” (Joel 6:3-6). “Whatever things are true, whatever honorable, whatever just, whatever holy, whatever lovable, whatever of good repute, if there be any virtue, if anything worthy of praise, think upon these things” (Phil.4:8). Those who do not “think upon these things” cannot see beyond some earthly goal, like becoming rich and famous, or of scoring big at the Super Bowl. They attract attention by pushing the extreme limits of modesty in dress, or exhibit the most shocking language and behavior. And those who have no clear goals of their own can have it all, second hand, of course, by sprawling comfortably in front of the TV. “Woe to them!” says St. Jude of those who have no love for spiritual things, “for they have gone the way of Cain…” (Jude 1:11). Could America be Nineveh, and not Sodom? The great city of Nineveh repented and did penance at the preaching of Jonas, and it was spared by God. 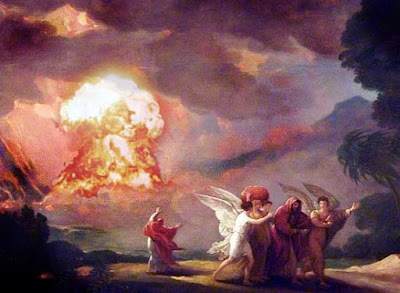 But the cities of Sodom and Gomorrah, found to be corrupt and full of unnatural vice, were destroyed in a torrent of fire and brimstone, as Lot and his family fled. An America that revels in sinful and immodest displays and is increasingly tolerant of sins against nature, will suffer a similar fate. Faith in Jesus Christ, the “door of the sheep,” is the absolute and necessary beginning of salvation. The “narrow way” begins with Jesus Christ, Who is the door by which we must enter: “Amen, amen, I say to you, I am the door of the sheep. All whoever have come are thieves and robbers; but the sheep have not heard them. I am the door. If anyone enter by me he shall be safe, and shall go in and out, and shall find pastures” (Jn.10:7-9). In the second place, we must remain with Him: “Abide in me, and I in you. As the branch cannot bear fruit of itself unless it remain on the vine, so neither can you unless you abide in me. I am the vine, you are the branches. He who abides in me, and I in him, he bears much fruit; for without me you can do nothing. If anyone does not abide in me, he shall be cast outside as the branch and wither; and they shall gather them up and cast them into the fire, and they shall burn” (Jn.15:4-6). “As the Father has loved me, I also have loved you. Abide in my love. If you keep my commandments you will abide in my love, as I also have kept my Father’s commandments, and abide in his love. These things I have spoken to you that my joy may be in you, and that your joy may be full” (Jn.15:9-11). Jesus is our way out of Sodom and Gomorrah, our ticket to the Kingdom of God. Get your ticket now! Enter by faith through the Door, Jesus Christ! “Let the word of Christ dwell in you abundantly: in all wisdom teach and admonish one another by psalms, hymns and spiritual songs, singing in your hearts to God by his grace. Whatever you do in word or in work, do all in the name of the Lord Jesus, giving thanks to God the Father through him” (Col.3:16,17). “Who is this that comes forth like the dawn, as beautiful as the moon, as resplendent as the sun, as awe-inspiring as bannered troops?” (Cant.6:10). “So now, O children, listen to me; instruction and wisdom do not reject! Happy the man who obeys me, and happy those who keep my ways, happy the man watching daily at my gates, waiting at my doorposts; for he who finds me finds life, and wins favor from the Lord…” (Prov.8:32-35). A valid Roman Catholic priest, ordained by a Pope Pius XII bishop, who teaches the Catholic Faith and administers valid Sacraments.